Infrared thermometers are a very useful tool for a lot of people. They can be used by manufacturers, engineers and of course, chefs. They’re incredibly useful as they have the ability to measure the temperature of objects without making any physical contact with them. We use ours primarily for measuring the base temperature inside our pizza oven. 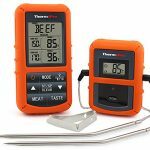 If you’re looking for an outdoor oven thermometer then an infrared thermometer will be perfect for you. In this guide, we’ll help you decide which of the best infrared thermometers is perfect for you. 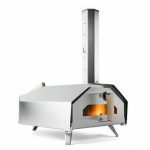 We previously looked at the best pizza ovens you can buy today, and we’ll be basing this guide around those pizza ovens. Infrared thermometers don’t directly measure temperature. They measure the reflected infrared light from the surface of the whatever it is pointed at. Everything with a temperature above absolute zero radiates infrared energy in the wavelength of 8–14μm. This can be converted into a temperature range of around -58°F (–50 °C) to 932°F (500 °C). 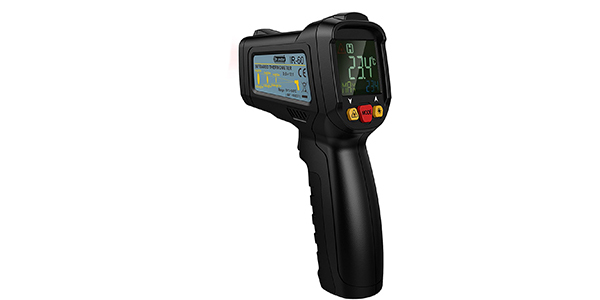 IR thermometers give very fast temperature reading, often in milli-seconds. 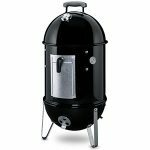 Comparing this to standard smoker thermometers which usually take a few seconds to 30 seconds that is a huge difference. Measurements can be taken of very hot objects or objects that are not directly accessible. For example, when using infrared thermometers for pizza ovens they get to such hot temperatures that it is not practical to use a standard thermometer. Another great use of temperature guns is that they don’t interact with the object they’re measuring. This isn’t hugely useful for pizza ovens but provides a small advantage over standard thermometers that could taint the taste of the food. They are generally lightweight, and incredibly easy to use, simply point at the food or base of the oven and read the temperature off. The downside is that only the outside of the object can be measured. Again, this isn’t hugely important as we’re not trying to measure the inside of a brisket but mainly the base of the brick pizza oven. 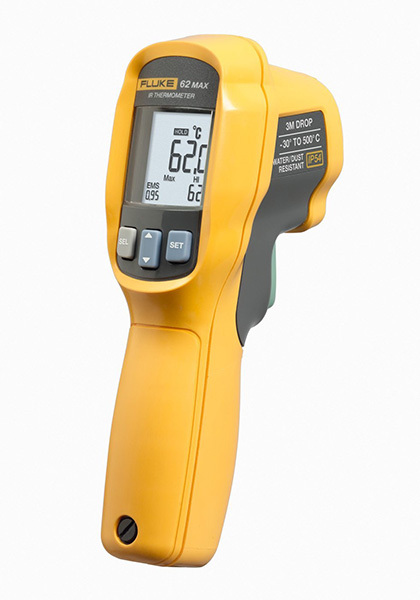 The Etekcity Lasergrip 774 the cheapest model of no-contact thermometer we’re review today. It’s a simple design makes it easy and quick to use. 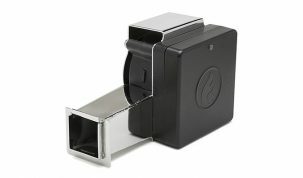 It’s powered by a single 9-volt battery (included) and automatically turns off within 10 seconds of no use. It will only turn back on when the trigger is pulled. This is a great little feature that makes a single battery forever. It’s built well, with hard plastics and high-quality rubber. Backlit LCD screen for clear reading of temperature. Less than 800ms response time. Built-in laser for pin-point accuracy. Overall, this is a very nice little infrared thermometer. For such a low price you can’t really go wrong. 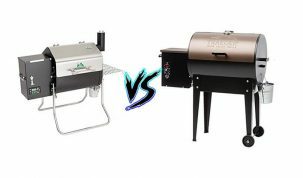 However, with a maximum temperature of 716°F it is only just in range of the coolest pizza ovens we tested. It won’t be able to give accurate reading at temperatures over 716°F in the Blackstone, Uuni or any of the higher end pizza ovens. 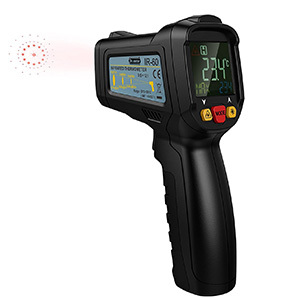 If you’re working with temperatures in the range that the Lasergrip 774 works at then this is a fantastic purchase. 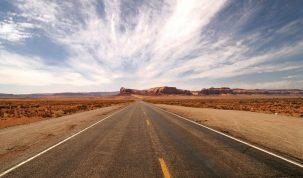 If you need something with a wider temperature range then keep reading. 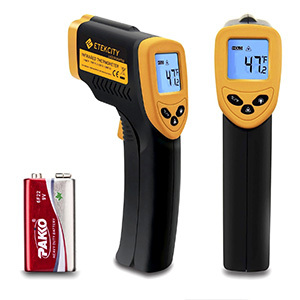 If you’re looking for something with a higher temperature range then the cheapest option you’ll be able to find will be the Dr.Meter Infrared Thermometer. 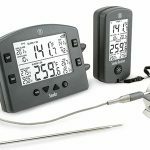 This thermometer boasts a temperature range of -58 °F (-50 °C) to 1022°F (550°C). It also has an accuracy of ±2°F/°C because of a built-in unit conversion. 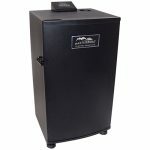 The Dr.Meter also has a 12 point laser system that helps accurately aim at objects at a safe distance. An auto shutdown after 15 seconds to preserve as much power as possible. A response time of less than 500ms. Overall, this is great option for anyone. It has a massive temperature range, it’s accurate at measuring and has an accurate laser system. This will cover most people’s needs but where it is slightly lacking is the build quality. Compared to some more of the expensive ones it feels a bit too plasticy and we can’t imagine the lifespan of this one being as long. 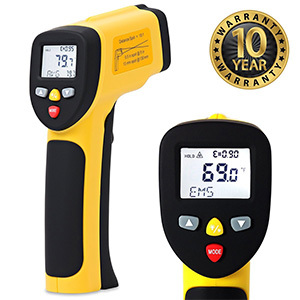 The ennoLogic non-contact infrared thermometer is a step above the Dr.Meter. 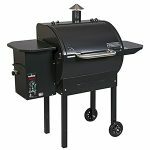 It has a dual laser system that gives an accuracy and durability that can be relied upon. This makes it very easy to find the temperature of a difficult to reach spot in a pizza oven. 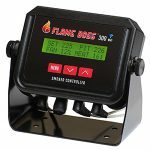 Add this to the fact that this model has an adjustable emissivity, which allows you to get the most accurate result from any material and you’ve got a very high end piece of equipment at a very reasonable price. Huge temperature range of -58°F to 1202°F (-50°C to 650°C). Toggle between °F and °C, and turn backlight and laser on and off individually, all settings retained between uses. Fast power-up and response time of less than 500ms. Adjustable High/Low set points with audible alarm. Included Holster and 9-volt battery. Large easy-to-read display with bright back light. As you might expect we found the ennoLogic to be a very easy to use and accurate thermometer. It produced the best results when faced with the smoke and variable materials in the pizza oven. It responded well with barely a noticeable delay. 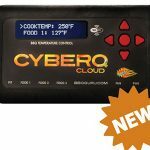 This is a great product and if you want effortless temperature measurements then this is a great option. It’s been our favourite choice for a while and is the one we use. Whilst, on paper, the ennoLogic seems to be the better thermometer we’ve found ourselves liking the Fluke more and more as we use it. We don’t think it quite beats the ennoLogic but it definitely gives it a run for its money. It doesn’t have as high a temperature range at -20°F to 932°F (-30°C to 500°C). It also doesn’t have as good an accuracy, at ±1.5°F/°C. Also, it Is definitely aimed more towards industry rather than home pizza oven chefs. But I think that’s why we like it. It’s small and very simple to use but also has a few nice features that we really like. It is also made like a brick and we’re pretty sure we could throw it around and it would still work just fine. It boasts a 3-meter (9.8 foot) drop test. 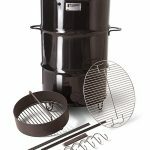 It’s also dust and water resistant which makes us feel like it belongs outside getting dirty with us as we cook and clean on the pizza oven. Less than 500ms response time. Large and easy to read, backlit LCD screen. Long battery life – over 10 hours with laser and backlight on. Dual lasers for pin point accurate measurement of user defined area. We’re not sure if you really need this if you’re only going to be measuring only the temperature in your outdoor brick pizza oven. But it’s a fantastic piece of equipment and we would recommend it. It doesn’t quite beat the ennoLogic in our opinion and we think you should buy that over anything, but this is a nice alternative if you’re looking for something that will last an age. All of these thermometers can, of course, be used for anything. 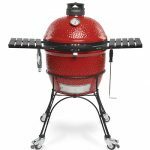 We find they’re useful for quickly checking the temperature of your Kamado Grill or Pellet Smoker. If you have any questions then please feel free to contact us or as in the comments.